I thought I would share the ending to the "Sentimental Christmas" post. 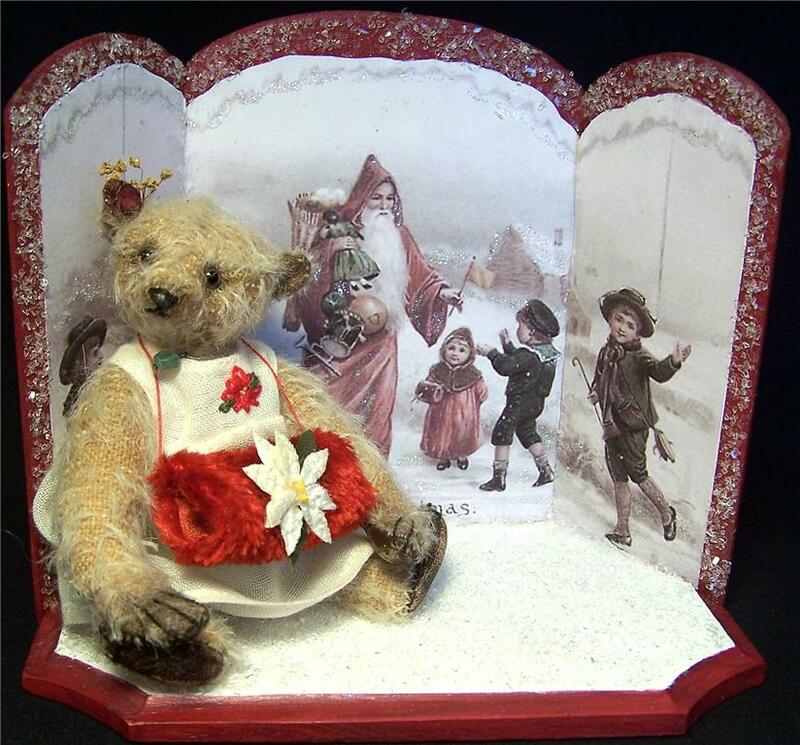 The Mink Teddy bear that I made from Marian Earle's Mink Stole was finished and mailed just in time for arrival on Christmas Eve. 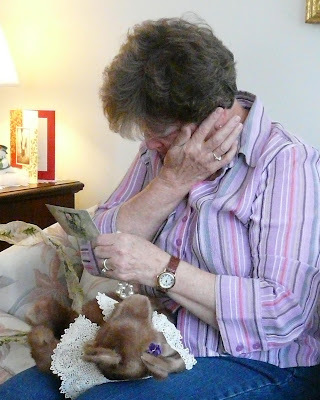 It was a special Christmas present for her daughter Dianne, since this would be the first Christmas without her mom. Here is teddy on Dianne's lap on Christmas day. I had mentioned in a previous post that a last minute repair was made to Teddy's right wrist. The vintage leather lining had split when I turned the arm right-side-out. 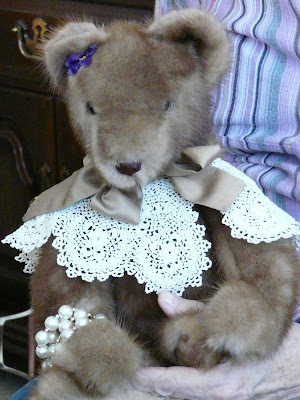 I was running low on time so I decided to repair teddy's wrist and cover the "surgery" with pearls. Well . . . it turns out that the pearls were even more of a personal touch. The women in Marian's family each wore jewelry (received from Marian on previous holidays) on Christmas Day. 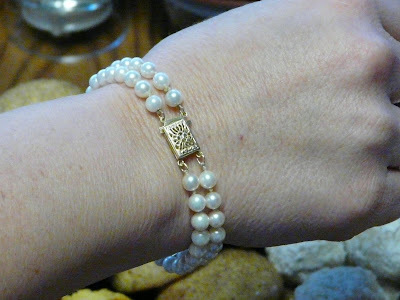 This pearl bracelet was one of the last Christmas gifts received and was a very close match to the bracelet on Ms. teddy bear. As you can see, Teddy's arrival was a very emotional moment. 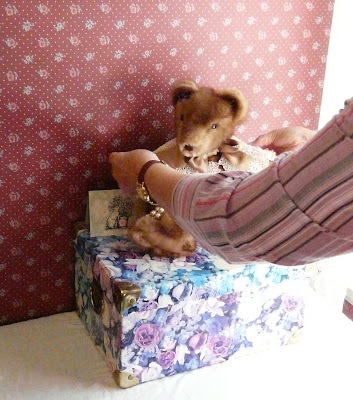 Teddy now sits above Marian's Memory Box. The purple flower near teddy's ear matches the mauve box nicely. What luck! Thank you for fowarding me the pictures of Christmas day. Teddy certainly looks happy in her new home. Oh, wow, I don't know you, I don't know Dianne and I don't know Teddy, but I'm sitting here crying my eyes out like they're my family! What a great story!!! Thanks for sharing! What a wonderful finish to the story we've been following. You really did a beautiful thing. Happy New Year to you and your family. I'm so glad the teddy arrived on time and Dianne was so thrilled with it. What a wonderful keepsake. How beautiful and heart warming. I'm so glad it all went well for you. That is so neat about the bracelet! Thanks for filling us in on the ending of the story of Teddy and Dianne. Absolutely a happy ending. What a beautiful gift you gave. God Bless You! 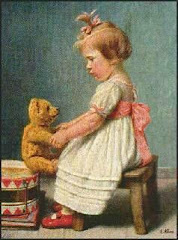 Loved the story ~ of the very special Bear for Dianne. That story brought tears to my eyes, Karen! That is so incredibly sweet! It's almost like HE lead you to make a "mistake" that wasn't really a mistake after all! It was meant to be! So sweet! Hi Karen, thanks for sharing this moving end with us!